2) 11% of AB’s opposed or strongly opposed KM’s TMX, in Sept 2017 Abacus online poll. 3) 1/3 of AB’s want to oil use decline: ‘In Canada’s top oil producing province of Alberta, more people would like to see demand for oil declining (38%) in 10 years as would like to see it increasing (28%)’ Also from Abacus 2017. 4) 20% of Albertan supported this position: “We need to greatly slow or stop development of and transmission of oil and gas in Canada.” in another 2018 Abacus poll for the Ecofiscal Commission which has Preston Manning on its advisory board, advocating carbon taxes. 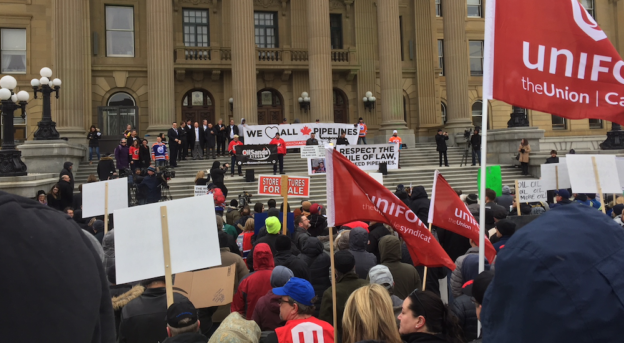 The most infuriating thing about this whole mess is the deliberate manufacturing of unanimity and the complete erasure of Albertans who are not in support of this pipeline. We are not eco-terrorists. Some of us simply have the temerity to question the economic case on which this pipeline is being sold. Some of us wonder why this government is determined to hitch our financial future to the “volatile royalty rollercoaster” instead of pursuing real revenue reform. Some of us voted for a party that was supposed to be the antithesis of the conservative cabal who ruled this place like their own private petro club for the last 4 decades. And now our voices don’t matter. There never is unanimity in a democracy, so that argument goes both ways. Polls in BC have actually shown more people support the pipeline than not. 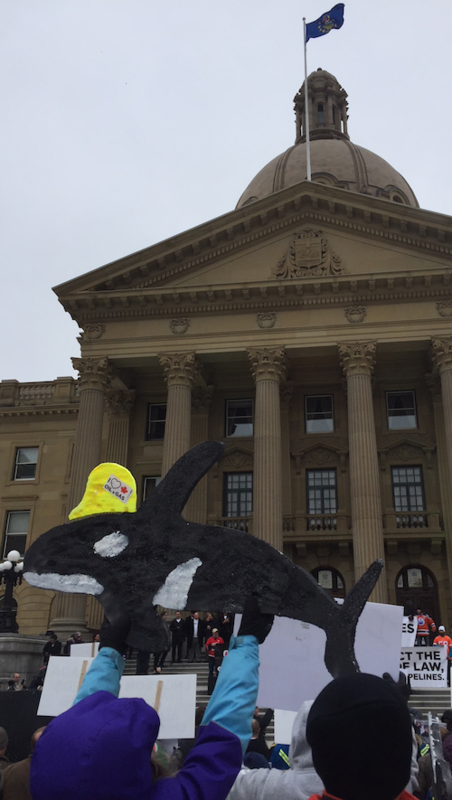 Should some vocal determined protestors be able to stop a project that has been approved and is felt by many to be both in Alberta’s and Canada’s interest? If anything we did in society required unanimity, we would do nothing and be at an impasse. The energy industry is an important part of Alberta’s economy and most Albertans realize that, particularly if they have family members, friends or neighbours who work in that industry and that is partly why a huge majority of Albertans support this pipeline. I would not casually dismiss it as a private club – it is actually hundreds of thousands of jobs in this province, as well as a significant source of government revenue for both Alberta and Canada. I think the pipeline debate is more of a partisan issue in BC, where political parties are divided on it, but in Alberta most parties seem to be in agreement with it. It is unfortunate that protests in general, wherever they are, tend to attract a more partisan and extreme crowd, but this shouldn’t cause us to lose sight of this here. Tying herself to KM’s pipe was NOT a smart move. Rachel has managed to make herself an embarrassment, even inside Oilberduh. Somehow I doubt any UCP’s or even ex-PCs will ever, ever vote for her. She must be sucking up to the oil patch. I can’t see any other explanation for her belligerent channeling of Ralph Klein’s ghost. I wonder how many people, like me, will vote “Left of New Tory Party” next year. I think you are correct, Mike. 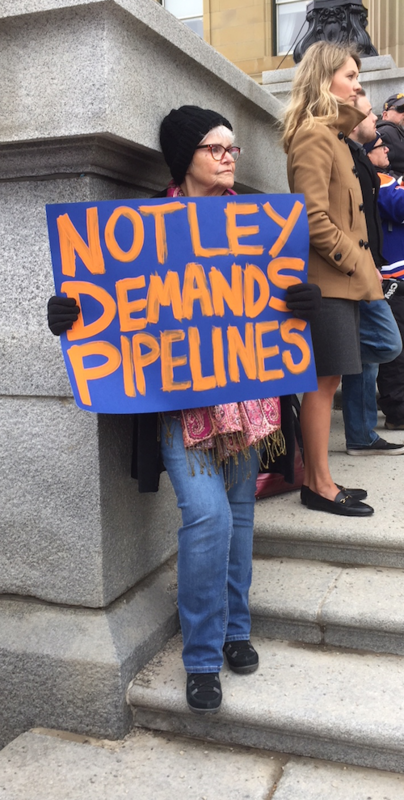 Rachel Notley is pursuing votes that are unattainable to her, and leaving her base of support disenchanted. I will still vote NDP in the next election, but more to try and stop Jason Kenney than out of enthusiasm.